After a season-changing loss like the one the Huskers suffered to Northern Illinois on Saturday, Coach Mike Riley’s Monday morning press conference was never going to be about the Xs and Os. He was going to field big-picture questions about where the program was heading and what he was doing to get it there. Those questions came fast and furious once Riley took the podium. For this week, that means taking a step back and re-examining how they do things. Riley said the Huskers aren’t going to reinvent the wheel, and they’re not about to start throwing things out the window, but the coaching staff is looking at what it can do as a whole to get players better prepared to play throughout the week. Riley said he sensed his team tighten up after two first quarter interception returns for touchdowns against the Huskies, and he felt them get down after the game. “You wouldn’t be human if doubt didn’t creep in after something like that,” Riley said. “That’s where the adults, the coaches in the room, have to help these guys. In 2012, when Riley was at Oregon State, he took over the offensive play-calling duties for a slumping team. 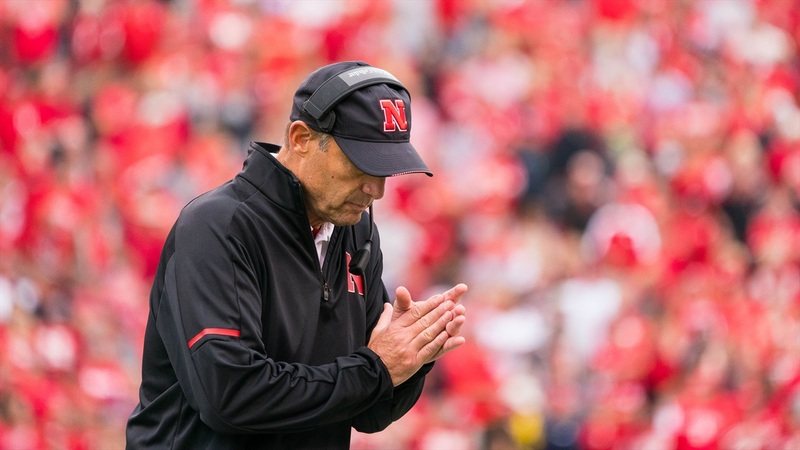 He said he’s thought about that, but at this time, he trusts his offensive coordinator, Danny Langsdorf, and isn’t going to be making that drastic of a change anytime soon. They can’t start making overhauls three games into the season and they’re “not going to reinvent the wheel,” but Riley is making tweaks this week that he hopes will jumpstart improved play. He hinted at a condensed playbook on offense and said they are looking at “anybody that is competing to get in and play.” Lineup changes are likely coming, but more out of necessity by injury than anything else. What the Huskers lack right now, Riley said, is execution. “This will oversimplify but it’s either a combination of technique of play and assignment,” Riley said of what the issues have been. He was addressing the offensive line specifically, but that statement can ring true across the board. While the players were in the locker room and Riley was addressing the loss immediately following the game Saturday, Eichorst made a surprise appearance. Riley said he hasn’t heard what was specifically said, just that he was given a blunt summary by Eichorst himself. The Huskers have five days to get things figured out before Rutgers arrives on Sep. 23 for the Big Ten conference opener. >> Once again, Riley had a lengthy list of injuries to address. Redshirt freshman Matt Farniok, who has started at right tackle for the injured David Knevel, suffered a broken bone in his wrist that required a pin be inserted. Riley said he “may be available for some duty” on Saturday but isn’t expected to play full time. If Knevel is still unavailable and Farniok can’t play, Riley said true freshman Brenden Jaimes and Christian Gaylord will be the next men up. >> As for lineup changes on the rest of the offensive line, one potential move would be moving starting center Cole Conrad back outside to tackle, where he played before this season, and starting sophomore Michael Decker. As was the case when cornerback Chris Jones was lost to injury and Riley was questioned on whether Kalu would move back to corner, Riley said they don’t want to hurt themselves at multiple positions just to make a change. “One thing you have to be careful about, guys are placed as starters for a reason and if you do that, are you weakening yourself at two spots too much?” Riley said. >> Riley said the decision making on punt returns needs to improve. Against the Huskies, primary return man De'Mornay Pierson-El looked unsure at times fielding punts close to the Nebraska end zone. Riley said the coaches need to do a better job of "creating situations where he is more prepared." >> Riley said he wasn’t concerned about the play call on the first interception against the Huskies. Langsdorf called up a bubble screen from the 10-yard-line and Shawun Lurry jumped the route to take it 87 yards to the house. Riley was more concerned with the decision by Tanner Lee to throw it. >> After the loss, Riley made sure to speak with Nebraska recruits that are either considering the Huskers or have already committed. Riley isn’t concerned about guys panicking and turning on Nebraska on the recruiting trail because he said it’s more about relationships than anything else. “The relationship and the vision of their life at the place is the key,” he said.